Wadley, GA – Darrell Gaskin, 53, entered into rest following an extended illness on Friday, April 5, 2019, at Comfort Creek Nursing and Rehab Center. Graveside services will be held from Hillcrest Memorial Park on Friday, April 12, 2019 at 1:00 P..M. with the Reverend Steve Patteson officiating. The family will greet friends at the graveside shortly before and following the service. Mr. Gaskin, a native of Augusta, was the son of the late Edwin Gaskin. He was a graduate of Butler High School and had proudly served his country in the U.S. Navy. 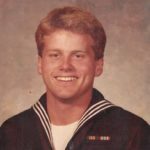 After serving his country he moved to Hilton Head and he owned his own welding business where he enjoyed designing and building with wrought iron. Darrell was a sailor and loved the ocean and sailing his boat. He loved his family and his pets, especially Oliver his beloved Jack Russell. He was a member of The First Christian Church of Augusta. Darrell has gone sailing. In addition to his father, Darrell was preceded in death by his sister, Michelle Gaskin. Survivors include his mother and step-father, Glenda F. and Charles O. Smith; his brother, Gordon Gaskin; his sister and brother-in-law, Joy and Pat Kraft; his half-sister, Alicia Rice; as well as numerous nieces, nephews, aunts, uncles and cousins. In lieu of flowers the family suggests memorials be made to the First Christian Church of Augusta, 629 Greene Street, Augusta, GA 30901.